This story was updated at 5:20 p.m. EDT. The second of Kepler's four reaction wheels — devices that allow the observatory to maintain its position in space — has failed, NASA officials announced Wednesday (May 15). Grunsfeld is a former astronaut who flew on five space shuttle missions, including three that serviced or upgraded NASA's Hubble Space Telescope in Earth orbit. But in-space repair is not an option for Kepler, which circles the sun rather than Earth and is currently about 40 million miles (64 million kilometers) from our planet. This chart depicts the frequencies of planets based on findings from NASA's Kepler space observatory. The results show that one in six stars has an Earth-sized planet in a tight orbit. 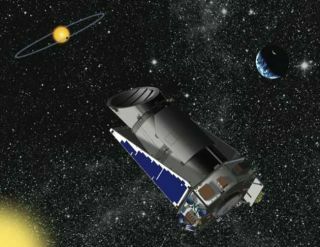 "Kepler has opened up the next set of questions in exoplanets," said Paul Hertz, astrophysics director at NASA Headquarters in Washington, D.C.
Once Kepler stops finding planets, he added, "the scientific output of the mission would continue for at least another year or two before you would see a dropoff."